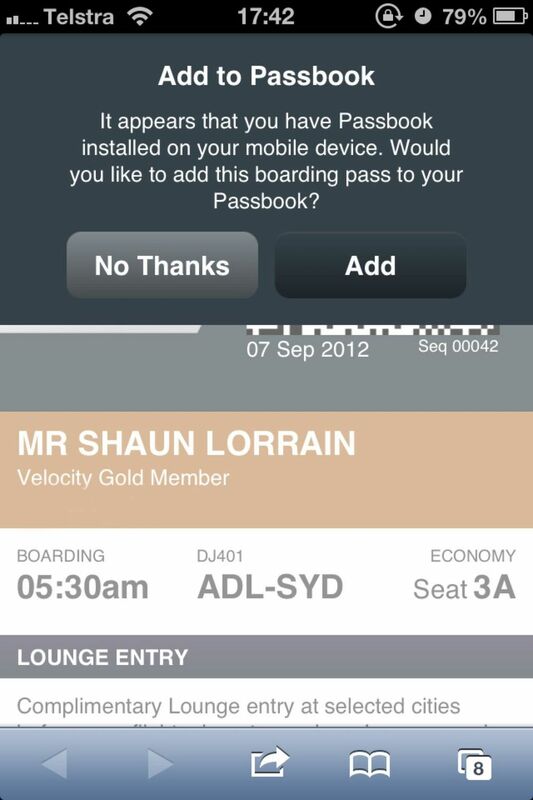 Update | Virgin Australia's Passbook mobile boarding passes will go live this week with the debut of iOS 6 and the iPhone 5. 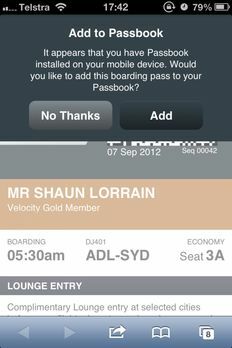 Previous | Virgin Australia, American Airlines, United and Delta are first off the mark to confirm their mobile boarding passes will work with Apple's Passbook app being built into iOS 6, which will be released this month along with the debut of the iPhone 5. 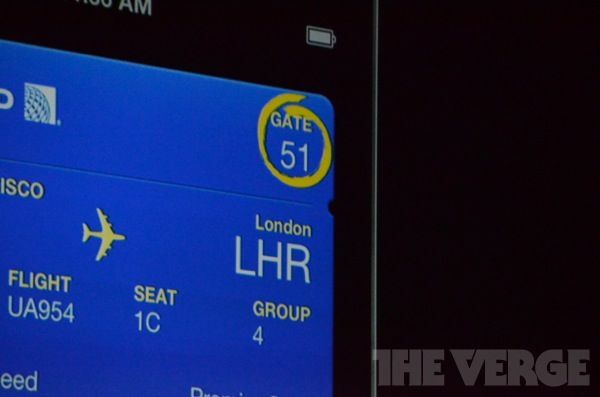 Passbook, as we've previously detailed, stores digital versions of boarding passes, movie tickets and membership cards. AusBT reader Shaun Lorrain checked in for a Virgin Australia flight using the airline's mobile website on his iPhone, which is running a developer preview edition of iOS 6 – and this is what he saw. 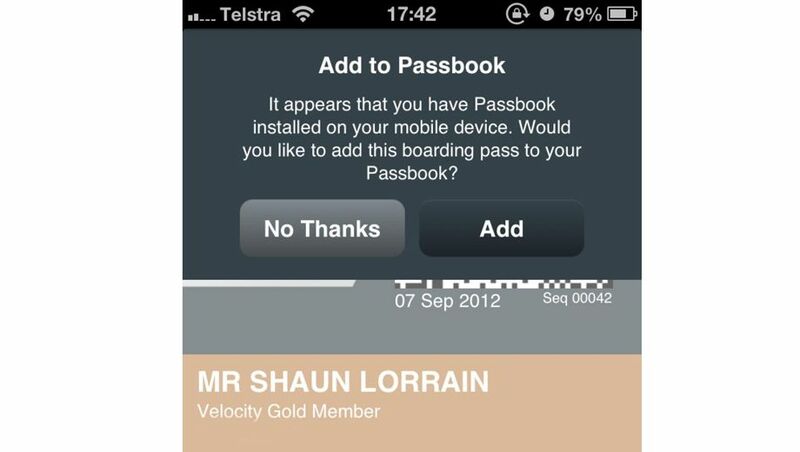 Yes, iOS 6 detected the mobile checkin and offered to save the boarding pass into Shaun's Passbook account. Passbook also offers live updates to these e-passes, such as flight delays and changes to the airport boarding gate. 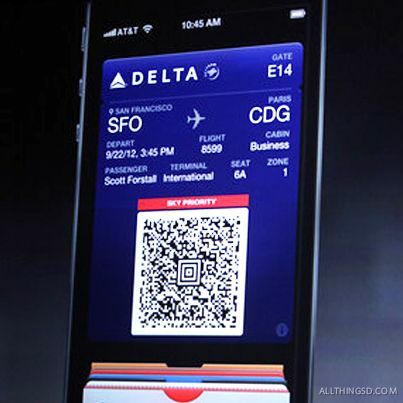 Delta's Passbook support was showcased during Apple's launch presentation for the iPhone 5, and American Airlines has also confirmed it will upgrade its iPhone app to be Passbook-friendly. 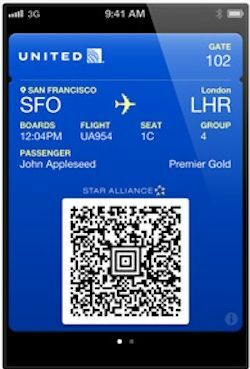 United Airlines has already committed to supporting Passbook with its own mobile boarding passes. Where to from here? We think that Passbook could prove to be the first step towards Apple's all-encompassing iTravel ecosystem, which Apple hopes will one day transform the travel industry the way Apple’s iTunes Store did the music industry. 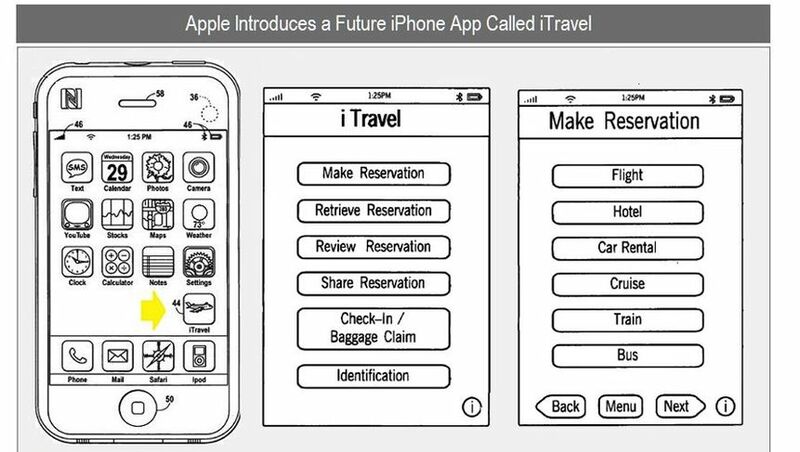 While Apple has not publicly discussed iTravel, dozens of mock-up screens like the one above were revealed in Apple's submissions to the US Patent & Trademark Office. Click here for our screen-by-screen walkthough of how Apple wants you to travel in the iTravel era. For the latest news for business travellers and frequent flyers, follow Australian Business Traveller on Twitter: we're @AusBT. I got excited when I got this link as well but unfortunately it didn't add it to passbook - will be great though. I wonder how long it'll be before the Virgin app is fully upgraded to work with Passbook? Nice forward-thinking of them! Open standard? Can all phones use the same tech? If not, I can't see why DJ is bothering. Better to focus on high-speed boarding with NFC than mucking about with a scanner and shiny screen phones. Free kick to Windows Phone 8 and Android. While Virgin have a nice PR win for iPhone users at present, I hope they keep up with the rest of the industry with NFC standards. I doubt NFC will really take off until Apple gets behind it, and other than looking pretty cool, I'm not sure why I can't live without NFC right now. RFID (NFC predecessor) can be used for checkin now with Qantas and many other airlines. I love the tap and go checkin. Doing this with the mobile would be one less card to scrounge around for in my already bulging wallet. Paypass and paywave are now appearing at lots of EFT terminals across the country. Guess what? You can use your phone to pay now if you load the relevant software on the phone. Metro systems OS are starting to adopt it too. Annoys me that I have to carry two Go Cards (one for wife and myself) when travelling in Brisbane. To have them linked to phone instead, brilliant. With NFC Android phones, you can even trigger car mode on your phone if you have a dock with an NFC sticker attached - less fumbling around to activate car mode. It just happens through putting the phone in the dock. There are so many opportunities here. Agree that there are endless possibilities. In much of Asia they've been RFID cards since forever. My point was only that there is very little adoption for NFC on smartphones, particularly in US and Australia, and will likely continue to be the case for the next year. As such I don't see this as being a free kick to Android or WP8. It would be a rather small part of the population who would look at the specs of iPhone vs say SG3 and decide on the basis of NFC. Comment on "Virgin Australia, Delta, American Airlines, United support Apple's Passbook app"